WeatherOps' complete GIS offering is available via ESRI Map Services served from our ArcGIS Server infrastructure hosted on Amazon Web Services. 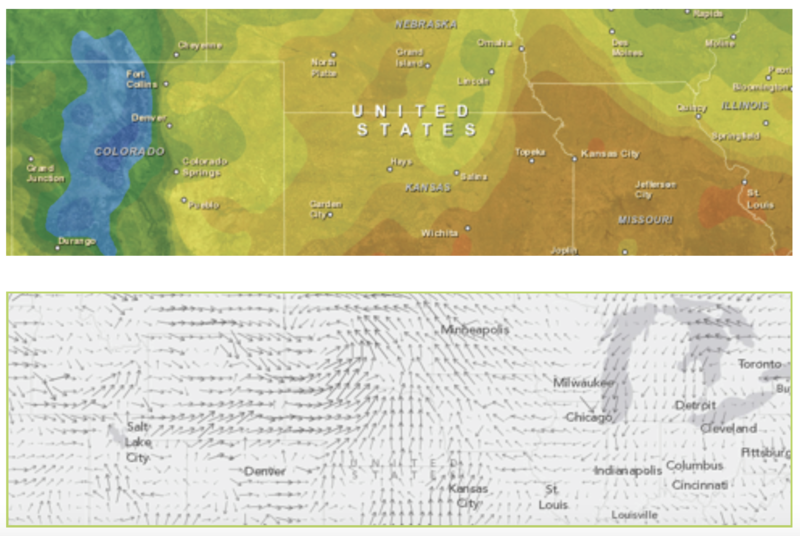 WeatherOps GIS provides the largest selection of precision weather layers on the market today. Make your message clear with quality WeatherOps data. When considering a data provider, ability to scale as your needs require is vital. WeatherOps data is served from a completely scaleable environment. Map Services are exposed through ArcGIS Server REST endpoints for quickly adding past, present, and future weather to any ESRI maps or apps. 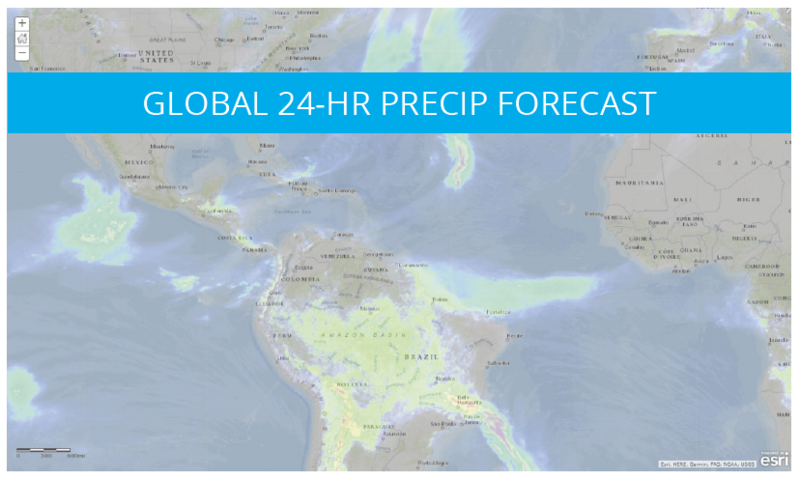 WeatherOps provides global forecast data services through our ArcGIS Server infrastructure with quality control handled by our expert team of meteorologists. Surface observations update every five minutes and include ten separate weather variables at a given location anywhere on Earth. 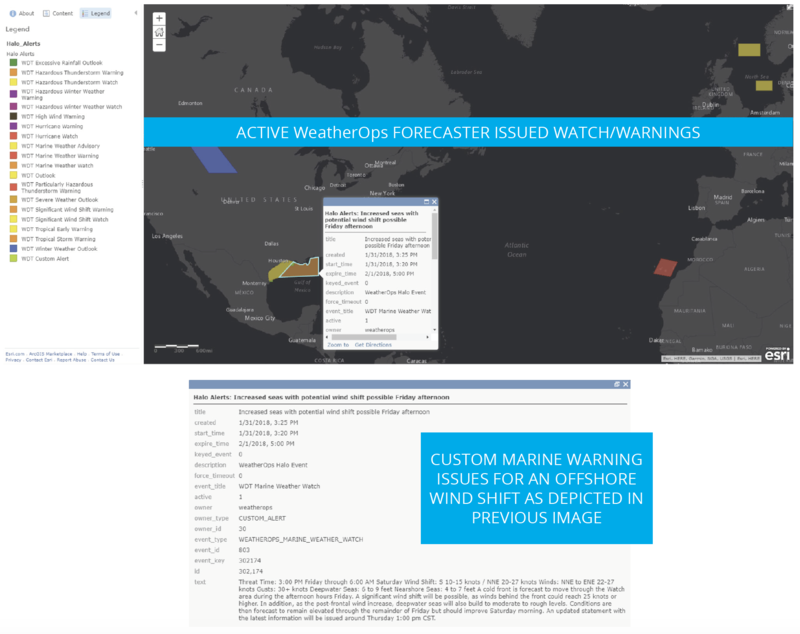 WeatherOps forecasters issue weather products and alerts for a variety of weather threats in the form of polygons, a service unique to the WeatherOps platform. Raw and quality controlled, single-site and mosaic radar data is available for the United States, North America, Australia, Europe, and Japan. Overlay a combination of radar data and short-fuse model data that predict and display where storms will be over the next 15-120 minutes. Easily the most comprehensive surface observation data aggregation for the Continental U.S. sourced from a variety of public, research, and private sources. 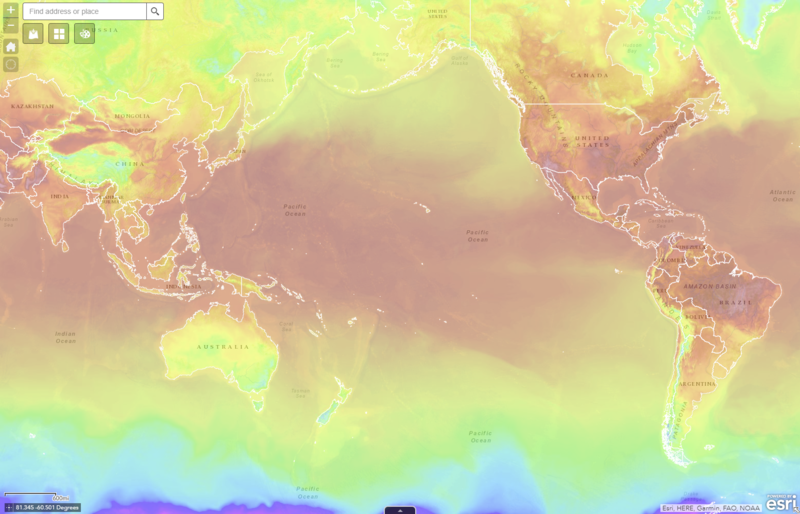 This global, gridded map service updates every 30 minutes and indicates cloud top temperatures to quickly determine storm intensity over a large area. This REST endpoint from the WeatherOps ArcGIS Server is updated in real-time as products are issued by the National Weather Service. Our point and line map service that indicates the location of High and Low pressure features globally. Add in Fronts for the full weather picture. A polygon map service by WeatherOps that contains the Storm Prediction Center’s daily issuance of categorical severe weather forecasts. 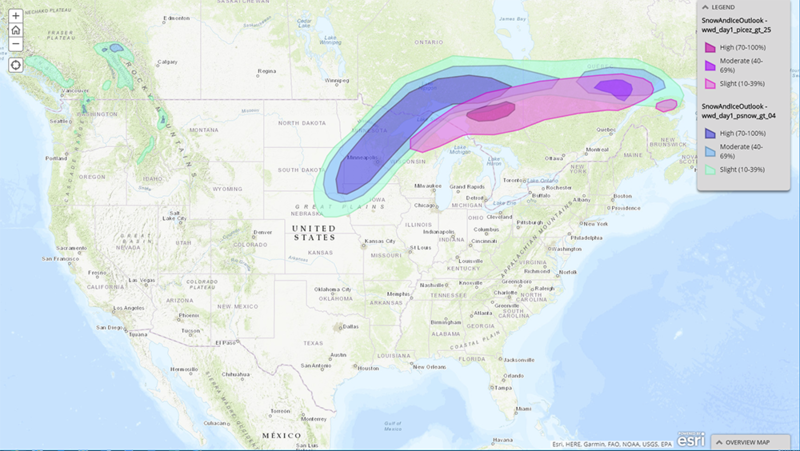 Winter Storm Outlook products provide snow forecasts, snow depth, and freezing rain forecasts for North America out to 3 days. Our lightning data service updates each minute and contains global cloud-to-ground stroke information including lat/lon, amplitude, polarity, and strike time. Our custom algorithm that predicts the threat of lightning in the next 60 minutes categorically using moderate and high threat indicators. This product analyzes real-time radar data across the United States looking for areas of rotation, then establishing an intensity track where the rotation occurred. Insurance, paintless dent repair, and roofing contractors find great value in our polygon map services that indicate where hail has fallen as well as its approximate size. Combining radar data and short-term weather forecast models, we identify areas of heavy precipitation and forecast where it will move over the following 60 minutes. Quantitative Precipitation Estimate (QPE) utilizes our exclusive quality controlled radar data as input, then outputs accurate rainfall totals in near real-time. This valuable WeatherOps algorithm combines observation point data, as well as model data, to output a grid of current weather conditions anywhere on Earth. A point map service showing observations of severe weather that are relayed to the National Weather Service (NWS) by various reliable sources. Our WeatherOps tropical storm map service contains several layers detailing all currently active tropical systems for any basin in the world. Aggregated forecasts from the National Hurricane Center (NHC) and the Joint Typhoon Warning Center (JTWC) providing global tropical forecasts. WeatherOps forecasters produce detailed reports and expectations for tropical storms occurring in any basin. Overlay these for comprehensive threat info. Easily locate hail, mesocyclone location, mesocyclone strength, storm movement, and Tornado Vortex Signatures. Tailored for electric power and communications utilities, the SPIA Index predicts the potential for damage to overhead utility systems, as well as outage duration, caused by freezing rain and wind events. Ready to learn more about how GIS can work for you? WeatherOps forecasters issue alerts for a variety of weather threats. These alerts are in the form of polygons drawn by forecasters and are accompanied by attributes that describe weather threats as well as timing. Our forecasters issue alerts for customer assets worldwide. The map and feature service available via ArcGIS Server provides a REST endpoint so polygons drawn by our forecasters are displayed beautifully in any mapping application. When combined with our WeatherOps service, alerts are sent by email, SMS, and push notification to mobile devices. 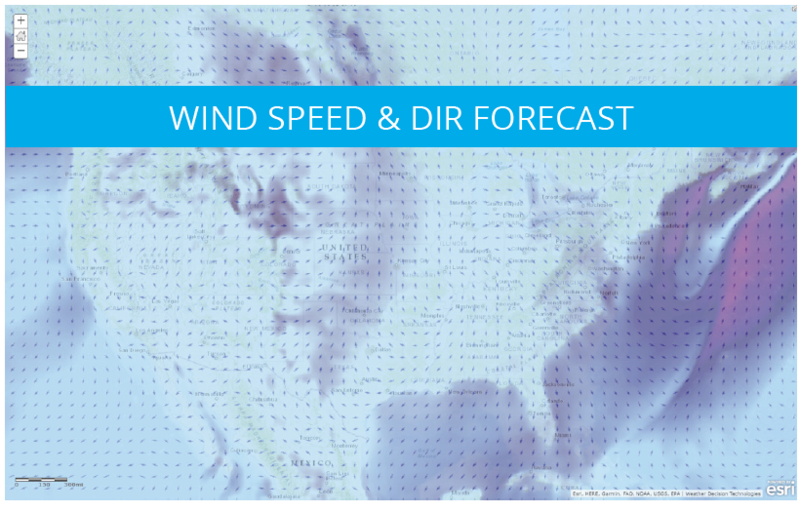 This service allows for parity across the enterprise whether using WeatherOps Display or a custom GIS application. WeatherOps processes raw, single-site radar data for the U.S., North America, Australia, Europe, and Japan. These are available as separate sites, a group of sites, or all sites. Once the data are quality controlled, they are placed into a single radar mosaic for a colorful depiction of weather threats across a very large area. Precipitation type is also depicted through our proprietary processes to distinguish between rain, freezing rain, sleet, and snow. 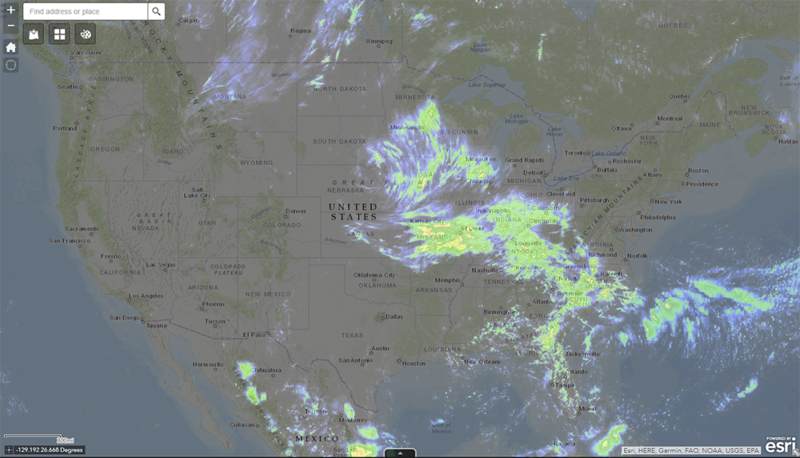 Our radar mosaic is available via 2 REST endpoints per region from WDT’s ArcGIS Server. WDT processes all the raw, single-site radar data in CONUS, North America, Australia, Europe, and Japan. Once the data are quality controlled, they are mosaicked into a single radar mosaic. Precipitation type is also depicted to distinguish between rain, freezing rain, sleet, and snow. 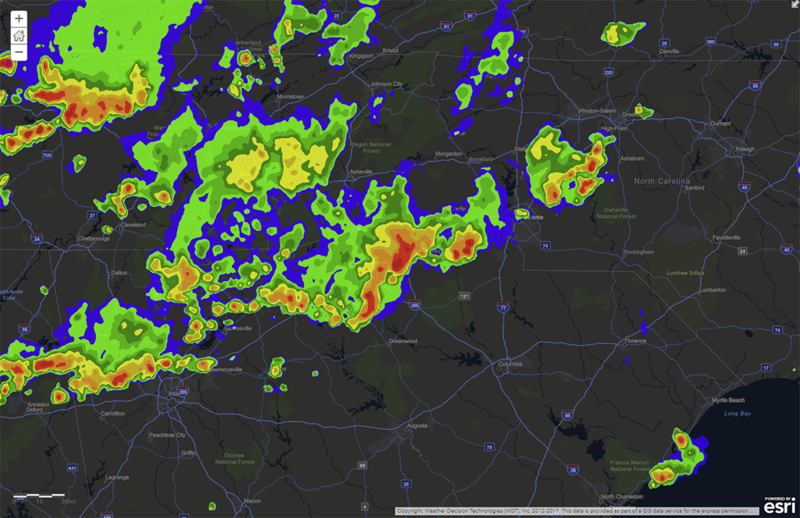 This radar mosaic is available via 2 REST endpoints per region from WDT’s ArcGIS Server. An exclusive overlay that combines current radar data and short fuse model information to predict where storms will be in the next 15-120 minutes. Our future radar product appears as a radar mosaic. This makes for easy transition from real-time radar mosaics to the forecast mosaic so that you don’t notice a difference in look and feel. WeatherOps maintains the most comprehensive surface observation data aggregation for the Continental U.S. from a variety of public, research and private sources. 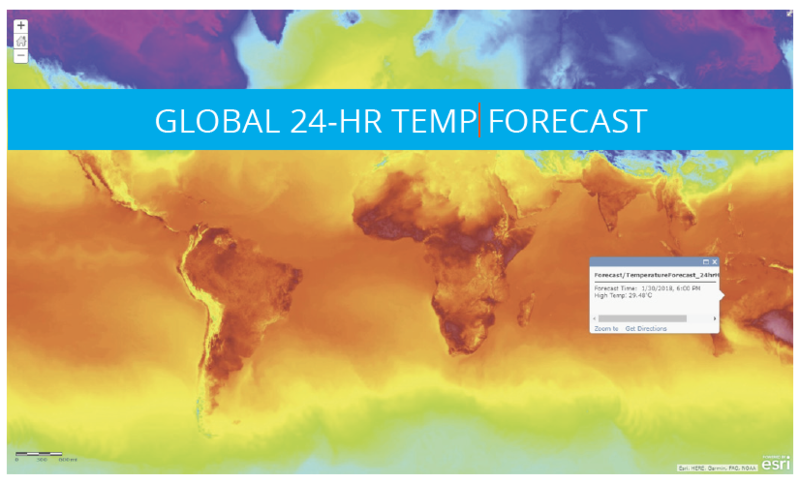 This gridded map service updates every 30 minutes indicating cloud top temperatures. Because cloud top temperatures correlate with cloud height, the height of the cloud can be estimated. Colder temperatures indicate higher clouds which indicate stronger convection (stronger storm). This REST endpoint from WDT’s ArcGIS Server is updated instantly as products are issued by the NWS. NWS products include Severe Thunderstorm Watches, Tornado Watches, Severe Thunderstorm Warnings, Tornado Warnings, Blizzard Warnings, and over 50 additional products issued by the agency. 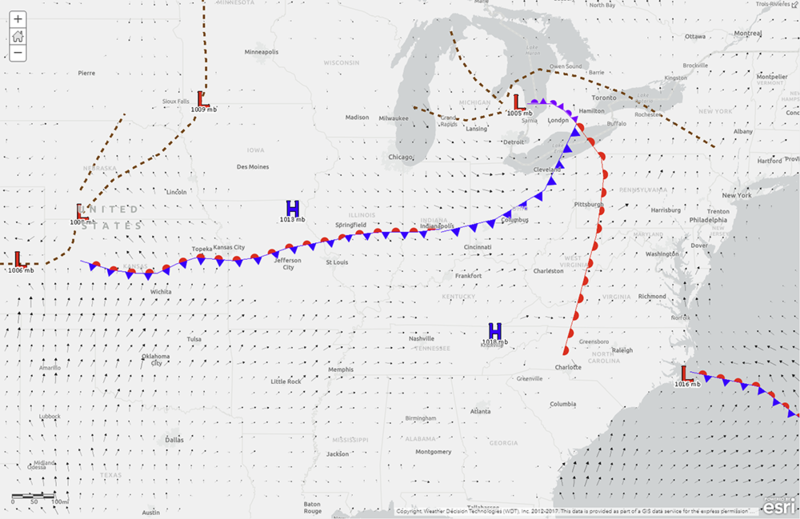 The high and low pressure components are represented by points in addition to cold fronts, warm fronts, stationary fronts, occluded fronts, and troughs which are all indicated by symbolized lines for easy reference. These products are issued for current conditions every 3 hours. 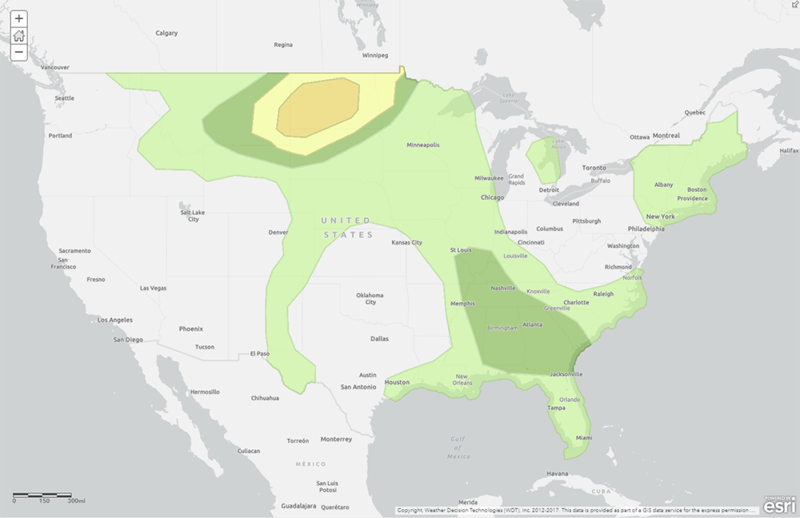 A polygon map service containing the Storm Prediction Center’s issuance of categorical severe weather forecasts. These forecasts are issued for Day 1 (current day), Day 2, and Day 3 indicating likelihood of severe weather. Day 1 updates are issued at 12am, 7am, 10:30am, 2pm, and 7pm CST, respectively. Day 1 outlooks also include probabilistic risk for severe hail (≥ 1” diameter), severe wind (≥ 58 mph), or any tornadoes..
Day 2 categorical outlooks are issued (1am CST) and (11:30am CST). Day 3 categorical outlooks are issued at (2:30am CST). Our Winter Storm Outlook products provide snow and freezing rain forecasts for the North America out to 3 days. Snow Forecasts probabilistically define areas where snow of 4”+, 8”+, and 12”+ is expected for Day 1, Day 2, and Day 3. The Freezing Rain Forecast categorically depicts areas at risk for more than 0.25” of ice accumulation from freezing rain using color-coded low, medium, and high probabilities. This outlook is updated daily. WeatherOps offers a high precision, extremely reliable lightning detection network with global coverage. 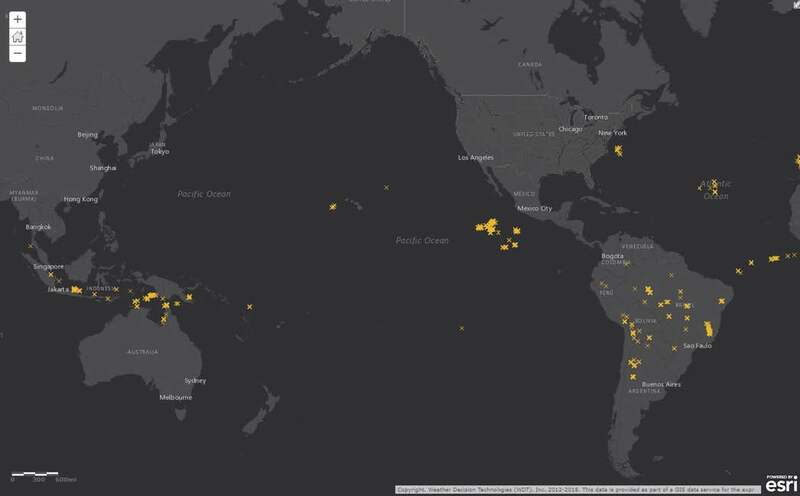 Lightning data is served as a real-time feed, making it available as an ArcGIS map and feature service. The lightning data service updates each minute and contains the previous 5 minutes of global cloud-to-ground lightning, which includes latitude, longitude, amplitude, polarity, and strike time to the millisecond. WeatherOps' Lightning Prediction Algorithm predicts the threat of lightning over the following 60 minutes categorically using moderate and high threats. The polygons are derived and output every 5 minutes from an algorithm that combines radar data and detected lightning. Multiple time steps of radar mosaics are used to determine the direction and velocity of all storm cells in the gridded domain. Detected lightning is then used to identify the area currently affected by lightning and advect that area along the forecast path of the storm cell. 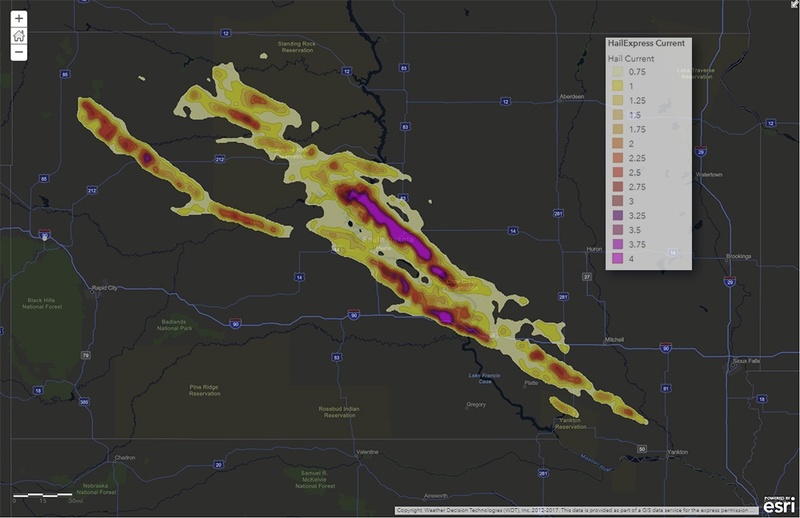 TornadoTrax is an exclusive product that analyzes real-time radar data across the U.S. searching for areas of rotation. When an area of rotation is identified, the algorithm is able to classify the strength of rotation, then plot the intensity, all of this in real-time. This product is often used by first responders and emergency managers with many assets to manage. Utilities and pipeline operators have relied on this product to help identify assets that may have been affected in real-time. This can reduce the manpower needed to scout for damage, reduce time needed to restore services, and expedite cleanup and containment efforts for hazardous materials, and the like, that may have been impacted. 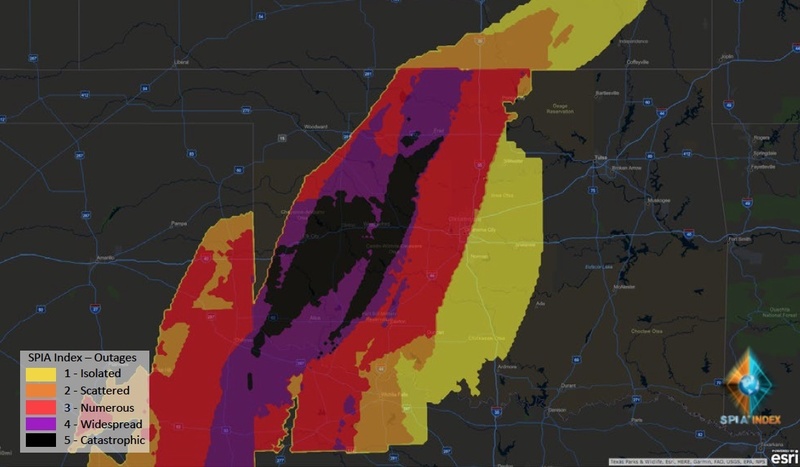 Those in the insurance industry, as well as PDR and roofing contractors, find value in these polygon map services showing where hail has fallen, as well as its approximate size. This data is separated into two services to show Current Day and Historical data. Current Day – every day at 6Z (1am CDT/12am CST) the data are reset. The algorithm accumulates hail swath data every 5 minutes throughout the day. Users can watch hail swaths grow with time as the dataset updates throughout the day. 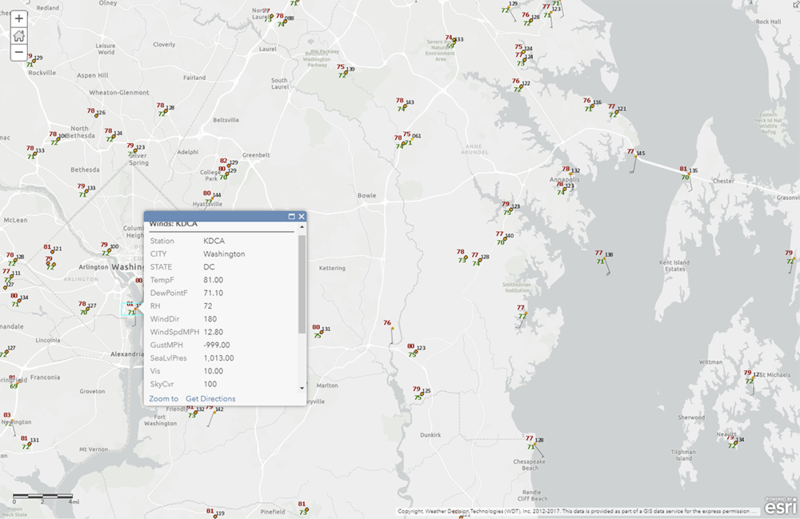 Historical – WeatherOps creates annual map services for archived hail swath data. The data are stored in monthly layers and attributed by date so users can query for single dates to better visualize specific hail events. The HPA combines radar data and short-term weather forecast models to identify areas of heavy precipitation and forecast where it will be moving in the next 60 minutes. The model takes radar mosaics over various time steps to determine the speed and direction of areas of heavy precipitation. We then use the model to determine where that heavy precipitation will move. This is identified by polygons indicating a moderate or high categorical risk. The algorithm updates every 5 minutes with a revised heavy rain forecast. 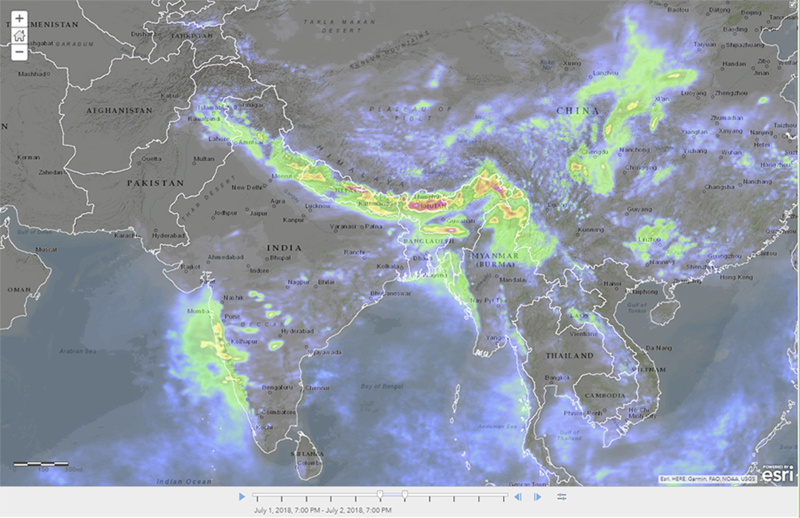 Quantitative Precipitation Estimate (QPE) is a product that utilizes WeatherOps' quality controlled radar data as input. Based on this clean radar data, our algorithm accurately estimates the amount of rainfall that has occurred across an area over a 1 hour, 6 hour, or 24 hour time period rather, than just at a point where a rain gauge is located. This proprietary algorithm combines weather observation point data as well as model data to output a grid of current weather conditions. The algorithm uses quality control routines and physics-based objective analysis schemes to create a grid of current weather conditions regardless of proximity to a weather observation station. The final product is a contoured polygon data set that is made available as an ESRI Map Service. In the case of our "Wind Speed and Direction" product within the grid, the data is actually made available as a point data set where wind vectors (arrows) are used to symbolize wind speed and direction. The point represents the center of each grid point. Current condition data services update every 30 minutes. 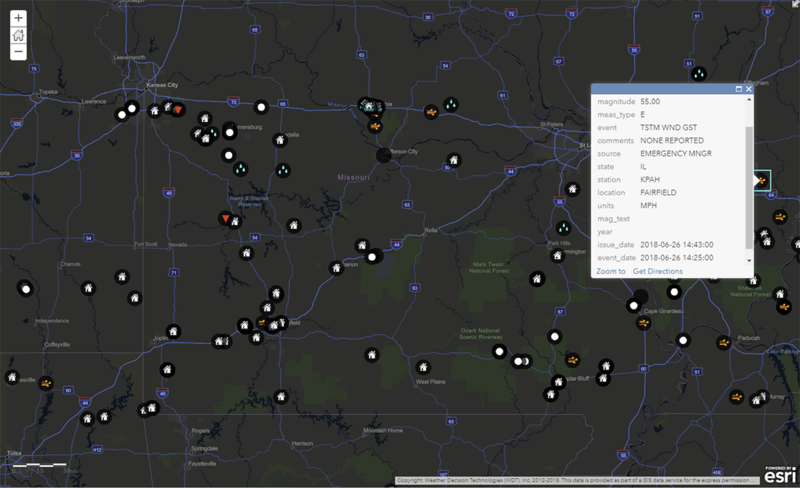 Our point map service showing observations of severe weather that are relayed back to the National Weather Service by storm spotters, local law enforcement, the general public, and other trusted sources. 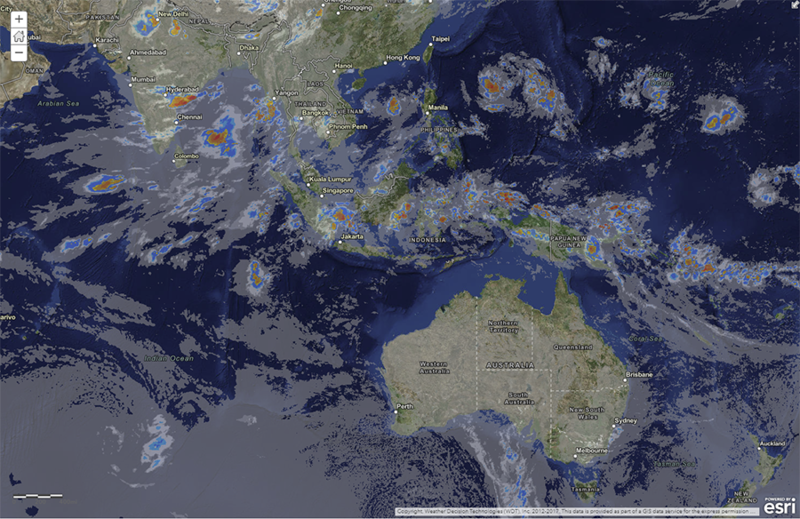 Our tropical storm map service contains several layers showing all currently active tropical storms around the world. This information is aggregated from the National Hurricane Center and the Joint Typhoon Warning Center and is typically updated every 6 hours. For all point layers (past, current or forecast), the pressure, sustained wind speed, wind gust speed, speed and direction of the tropical storm, and rating (Tropical Storm, Category 1, Category 2, Category 3, Category 4, Category 5) are available attributes. The map service shows all of the following data layers for each currently active tropical storm: Observed current location, forecast location, observed location, forecast track, observed track, forecast error cone, as well as forecasts for 34, 50 and 64kt winds or higher. WeatherOps aggregates forecasts from the National Hurricane Center (NHC) and the Joint Typhoon Warning Center (JTWC) to provide global tropical storm/hurricane forecasts. 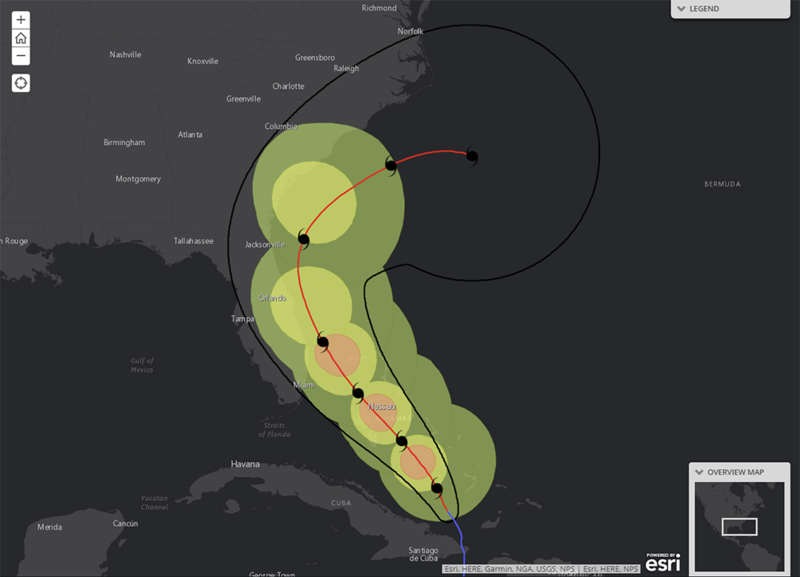 This REST endpoint from our ArcGIS Server includes the observed locations (starting when the storm achieves tropical storm criteria), observed track, current location, forecast locations, forecast track (line), forecast error cone, and forecast wind radii (34kt, 50kt, & 64kt). This data service updates as new forecasts are issued from the NHC and JTWC. WeatherOps forecasters create custom forecasts for tropical storms around the globe. 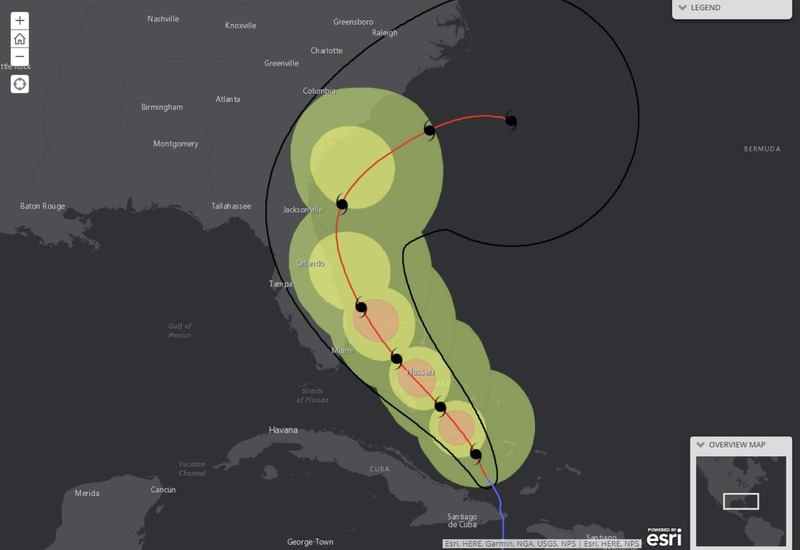 They use similar parameters (prediction/forecast, forecast cone, forecast track) as the forecasts issued by the National Hurricane Center. However, our forecasters create their own which will often deviate from the NHC/JTWC forecasts. In 2017, our Significant Tropical Storm Advisories issued on average 50 hours before products from the NHC, and the WeatherOps forecast tracks verified better than the NHC 5-year average at all forecast times in 2017. Tropical Forecasts update every 6 hours and are also available in the WeatherOps Display. 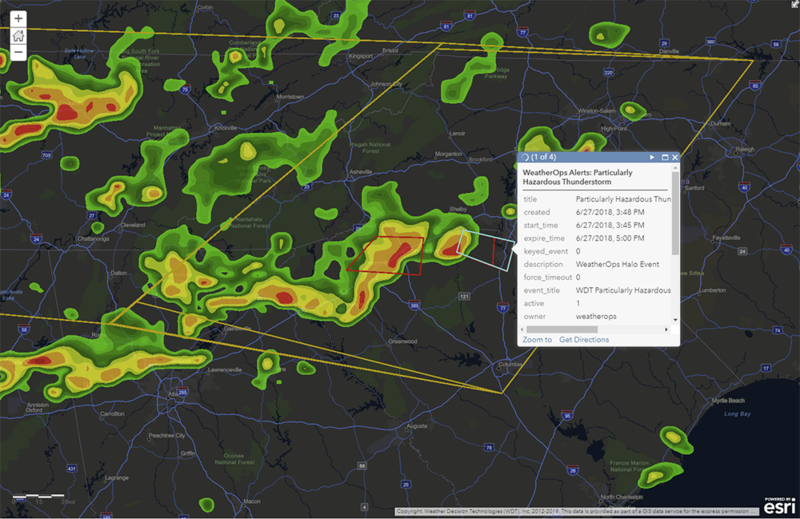 Easily locate hail, mesocyclone location, mesocyclone strength, storm movement, and Tornado Vortex Signatures through quick-reference icons and time-enabled storm path lines. Storm Attributes are layered over single site or mosaic radar products. The Sperry-Piltz Ice Accumulation (SPIA) Index is designed to help electric utilities, cooperatives, and transmission organizations forecast damage to their elevated infrastructure due to the impacts of ice storms. The SPIA index is built on nearly a decade of ice storm data consisting of both weather and resulting damage. SPIA’s unique combination of forecast ice accumulation and winds creates an easy to understand index with values ranging from 1-5 (1 – isolated impacts, 5 being catastrophic damage and outages lasting for more than a week). The SPIA Index is the best tool for supporting operational decisions regarding where/when to stage crews, whether to put contractors on retainer before other organizations and determine if it’s necessary to contact mutual aide partners before an ice storm. 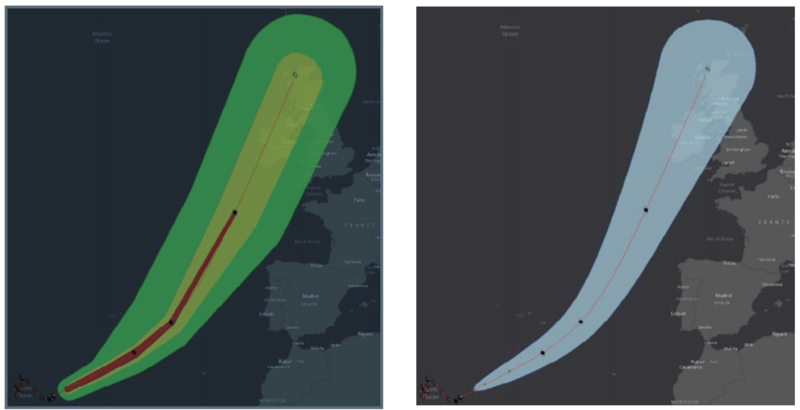 The SPIA index is currently available as a time-enabled map server and a feature server showing forecasts for the index out to 3 days in 6 hour time steps. Whether for display in an operations room, executive briefings or for alerting using the GeoEvent Server, SPIA is a critical tool for GIS professionals supporting electric utilities through the winter months. The marine site-specific weather forecasts consist of a detailed 7-day Marine Daily Planner.